Whenever I walk into Hampstead Heath, I feel I leave the chaos of an urban city like London and enter another world; somewhere where peace leads and nature reigns. For those new to the city, Hampstead Heath is a ginormous (about 320 hectares!) ancient park in London. There's many things you can do here: from sunbathing and barbecuing to having a swim at their natural ponds. How cool is that? Even if you are one of those who doesn't have enough with a relaxing day out in the nature, this area will provide you plenty of cultural spots and unknown gems to discover. One of them, and possibly my favorite, is Pergola & Hill Garden. If somebody would have told me this existed in London few weeks ago, I would have not believe it. 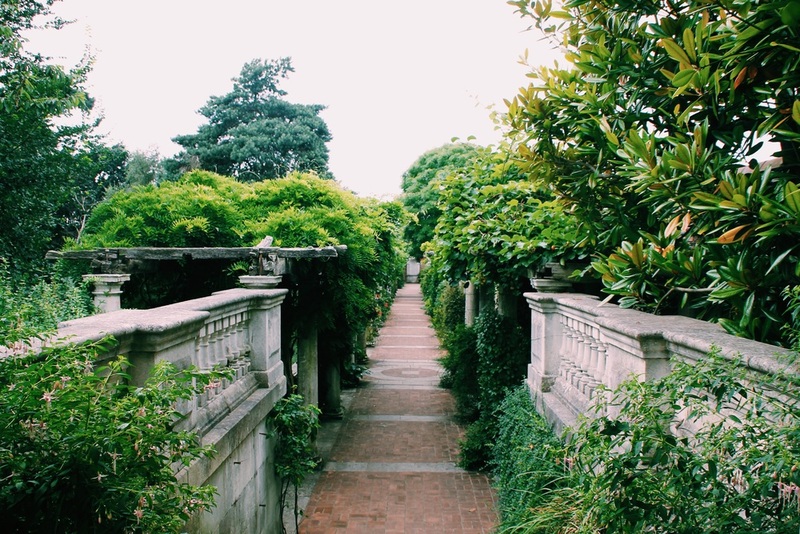 Remarkably unknown to many, this secret garden is located west of Hampstead Heath, about 25min walk from the overground station. It is definitely one of London's best kept secrets. A grand and splendid garden with a beautiful dark touch. Walking through it, discovering all its passages, made me feel I was part of a fairy tale. 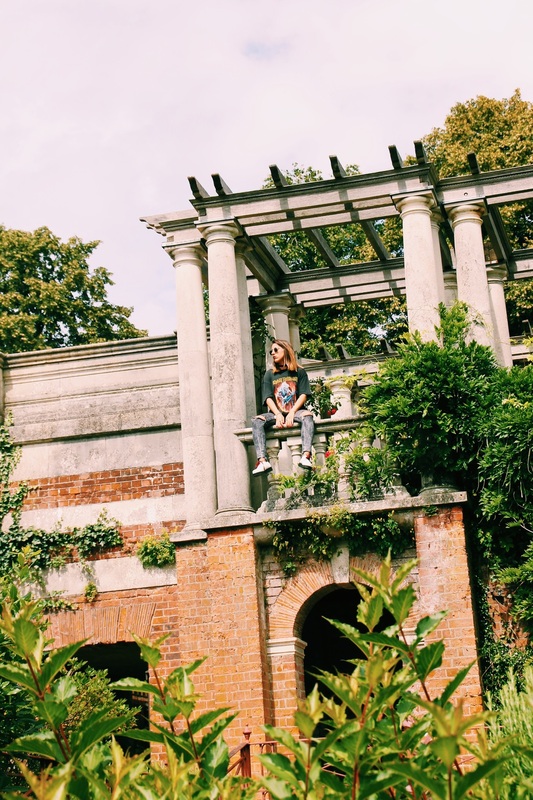 the history of the Pergola goes back 100 years ago, when a wealthy philanthropist called Lord Leverhulme decided to extend his large town house and set an extravagant Edwardian garden to host parties (good fellah) and long summer evenings with friends. Unfortunately, when Lord Leverhulme died, his place was left untouched and what it once was a sparkly and glorious state was left to a moody and eerie land. Don't get me wrong though, this place is mesmerizing, and it hasn't certainly lost its unique character, reason why you should check it out. Also, about 5-10 minutes walk from it, you've got two great pubs to wine and dine after your long walk: The Old Bull & Bush and the Spaniards Inn, my personal favorite. But going back to the Pergola. I've seen lots of people using the space to take beautiful princess portraits, we even witnessed a wedding while we were there! But you know me, I don't like the what everybody does. And if the place has turned into something dark, why not play with it? And so I did. As you may know, band t-shirts are very in trend these days, and I could not be happier about it. 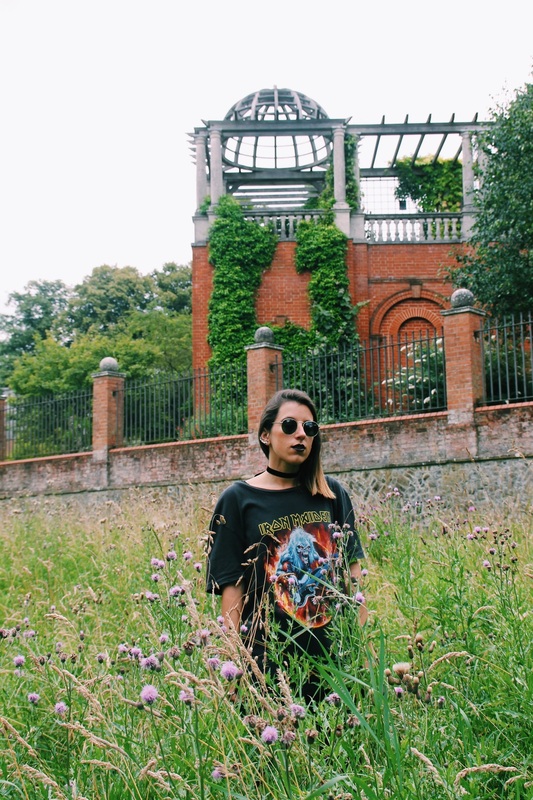 For the occasion, I put my best goth outfit on, and my friends and I when to spend the day in this outtaspace land that is Hampstead Heath.